SEGUE Sunrise Tension Fabric Wall is a tension fabric displays which takes advantage of the new Silicone Edge Graphics by incorporating the SEG technology into the Sunrise graphic wall product to provide a stunning visual that is fast and effortless to set up and breaks down into a comfortable size for easy storage or transportation. Available in both 10 foot and 20 foot trade show exhibit models. The SEGUE is a flat wall system with competes with The Wall and several other flat graphic systems. It's not meant to compete with in line trade show dispays, but to provide an efficient way of creating a backwall without the need for accessories. The SEGUE is quick and easy to set up and tear down with a graphic that is economical to replace when desired. Adapting to changing market conditions is what every great supplier has to do, and Classic Exhibits, to the delight of their trade show display distributor network, has proven their ability to accomplish just that. What did Classic see that gave them the inspiration to forge ahead during bad economic times to create new marketable products? Classic noticed that they had several shapes of aluminum extrusions that that they already purchased that gave them an extraordinary large amount of linear footage per dollar when compared to others. 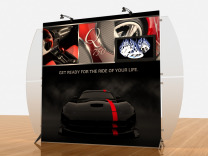 As they moved forward based on good intuition and a little careful planning, they've been able to introduce a whole group of successful displays that have all brought new life into the custom modular hybrid displays segment of the trade show exhibit industry. 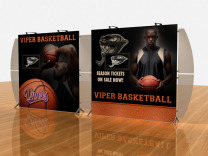 Some of the more well received products that were designed during this 2 year period of time were the patented Perfect 10, Magellan Miracle, and the Sacagawea custom modular hybrid displays; all examples of the new trend of tension fabric displays in the trade show market. For the resellers of Classic Exhibits products, the future looks bright because of the creativity and ingenuity on Classic’s part, and some great promotion through an online program Classic created called exhibit design search, which is an internet search program for trade show exhibits which we utilize extensively on the ShopForExhibits.com web site.